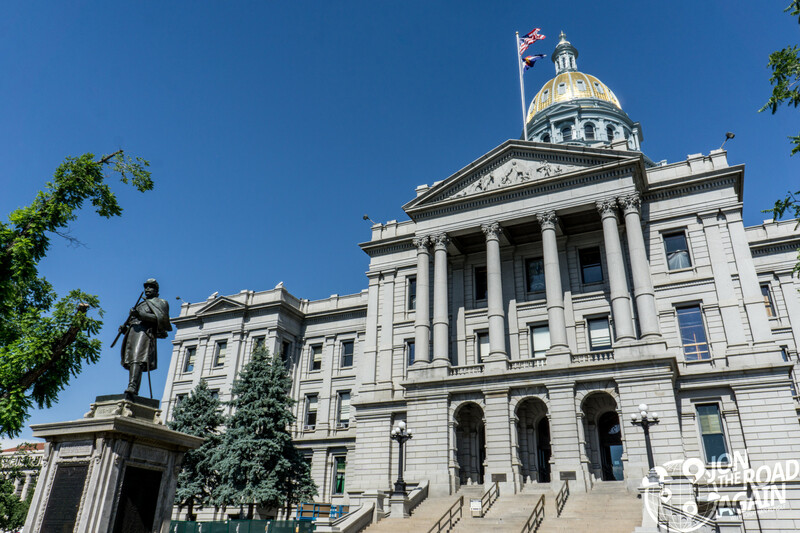 With only a few hours to sight-see before boarding a flight home to Seattle, I choose the Colorado State Capitol and it’s dome-level observation deck. Let’s go see what makes this state tick. Doing my research just outside of the city limits, I learned that the only way to get into the dome is to take the guided capitol tour. Visiting the dome was a must in my book. The last tour of the day was at 3:00. It was 2:45. Can I get into downtown in time? Well, yes, since this blog post exists. 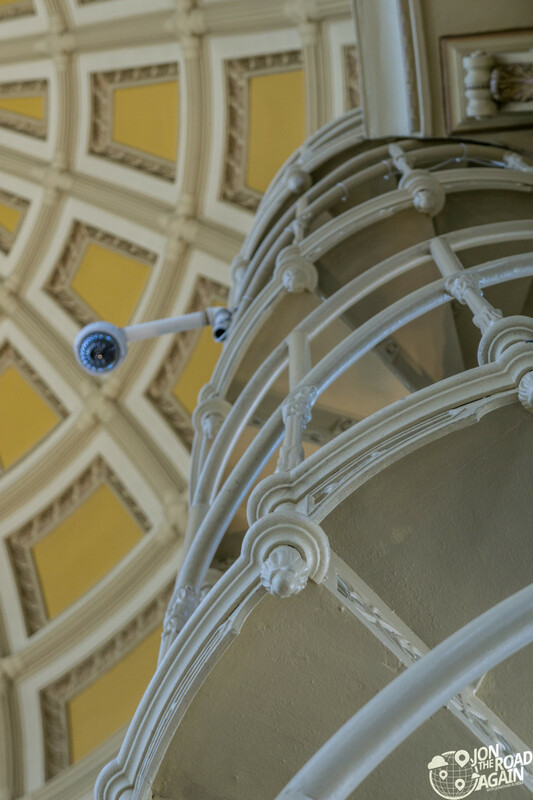 Walking in, after the metal detector and registering with the tour group, the first thing to do is look up—the rotunda is open all the way to the top. Well, nearly. 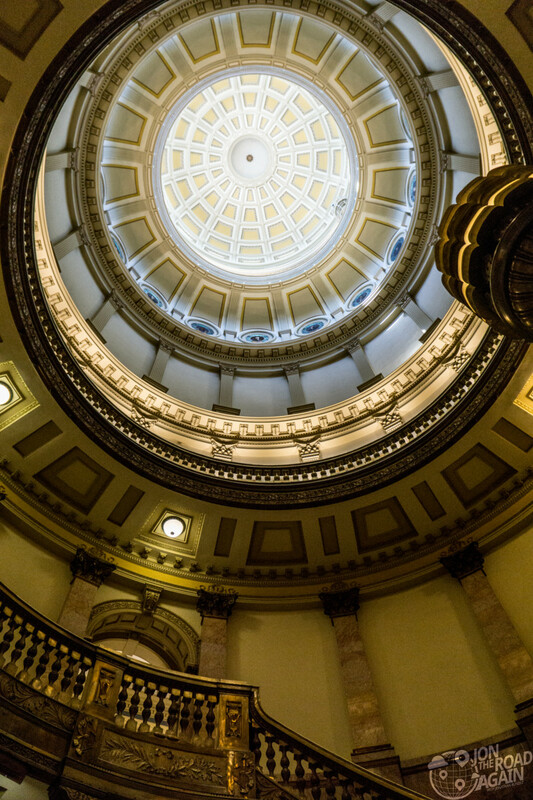 The gilded dome is actually built above this interior rotunda ceiling. Little details are visible all over the building, like these really great door knobs. 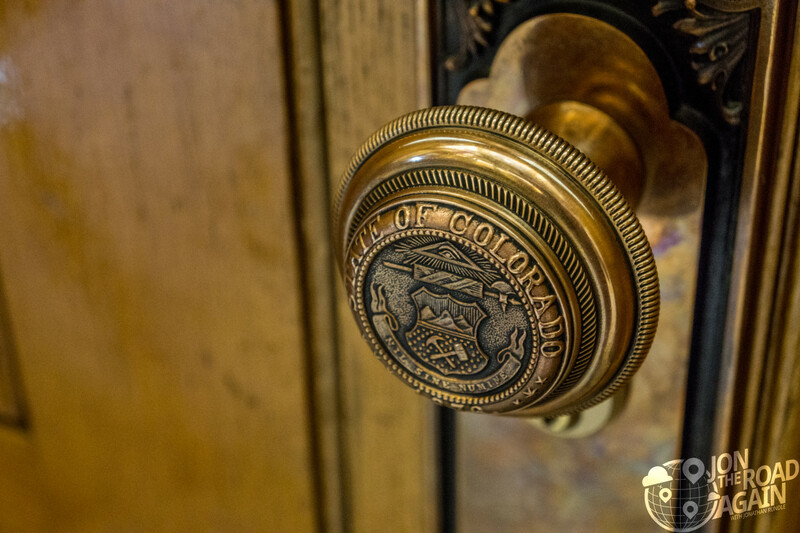 The Colorado Rose Onyx used throughout the building was quarried in Beulah, Colorado. 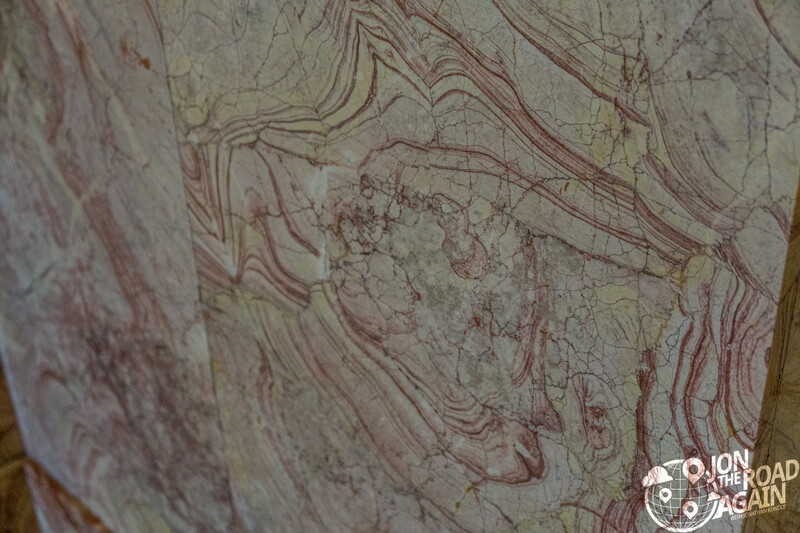 A fun part of the tour includes looking into the marble for patterns. Below, you can see the outline of a cowboy’s profile, complete with neck bandana. Fun fact: the building took so much rose onyx, it consumed the entire known supply. Nice job! 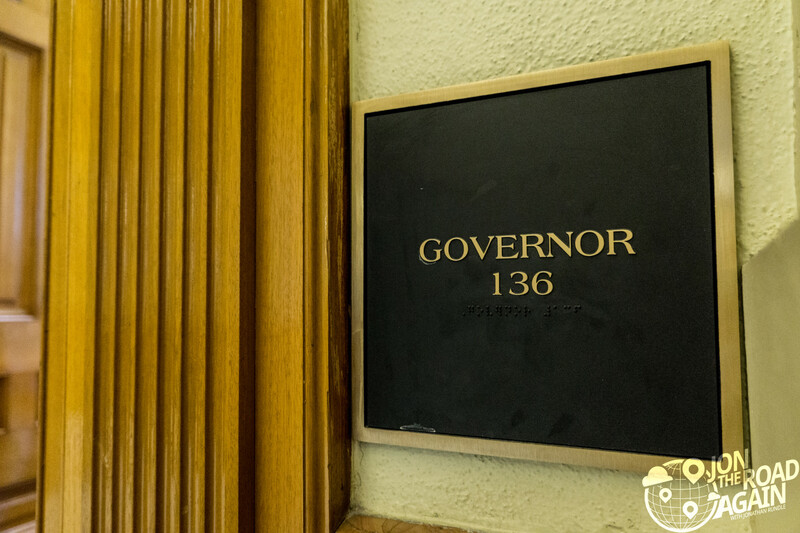 The governor’s office is open – let’s see what’s inside. Why, there’s a horse in there. Whats the deal with that? Well, it dates back to Gov. John Hickenlooper’s time as mayor of Denver. 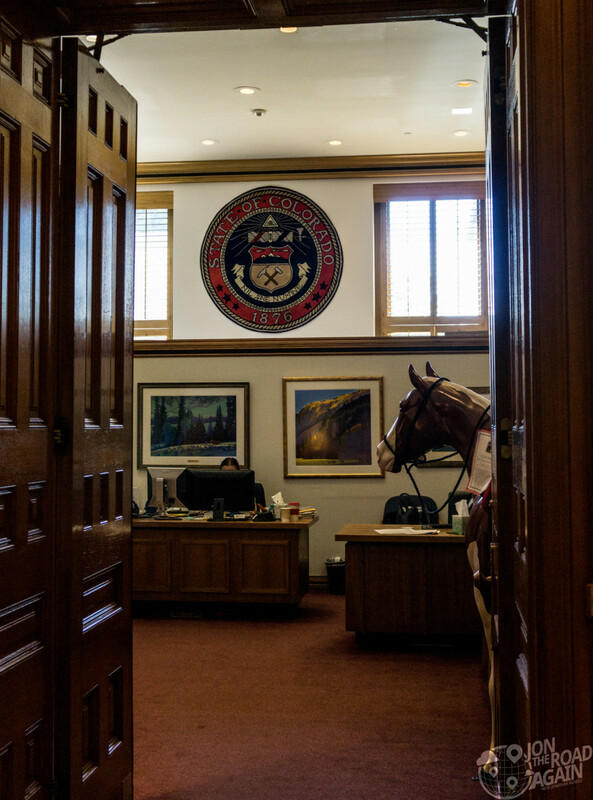 He had the fiberglass horse (named Scout) in his office then and it made the move to his office in the capitol. It was originally part of a larger public art piece called The Yearling. Because the city of Denver had to repaint the horse every couple of years, they replaced it with a bronze cast, leaving the fiberglass Scout without a home. The then-mayor adopted him. 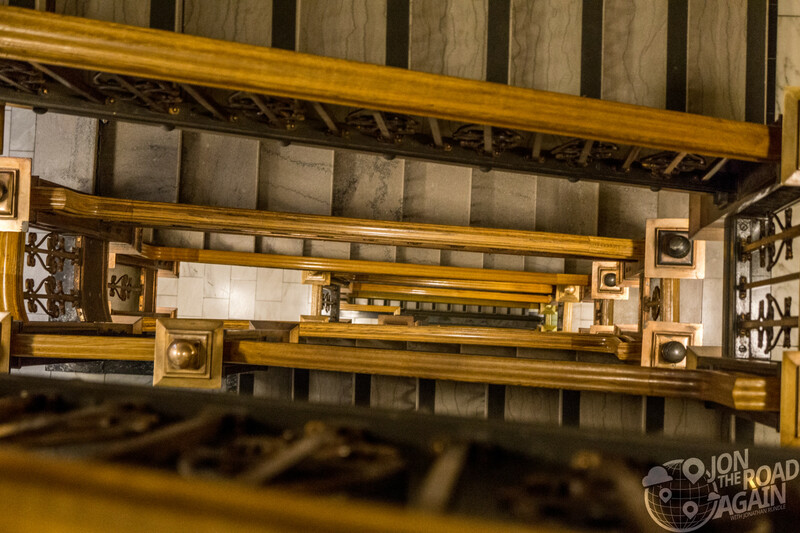 Moving on to the rotunda staircase, the there are eight murals on the walls of the rotunda in honor of Charles Boettcher, a Colorado businessman and later philanthropist. The murals were painted in 1940 by Colorado artist Allen True. Each mural is accompanied by an excerpt of a poem written by Thomas Hornsby Ferril, who was later named Colorado’s poet laureate. Up the stairs, the Gallery of Presidents feature, you guessed it, portraits of all of the Presidents by Colorado artists. Next up, it’s time to climb into Mr. Brown’s Attic, the last room before entering the dome. 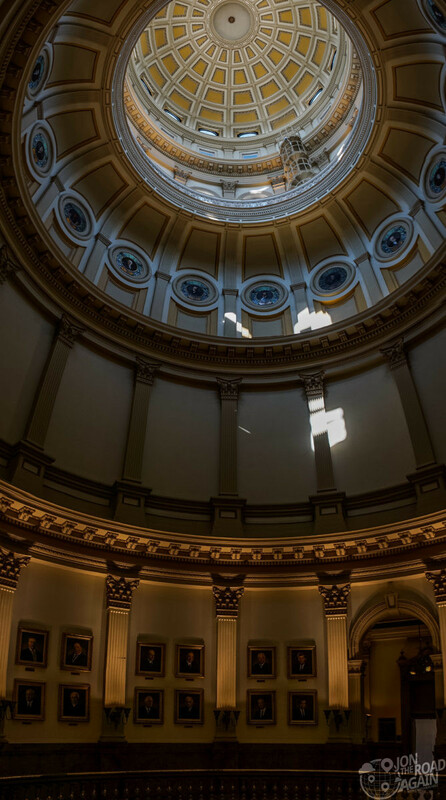 Here, you can see informational displays on the history of the Colorado State Capitol and look through windows to see the structural components of the roof and dome. Once into the dome, you can look down the 120 or so feet to the floor below. From floor to dome ceiling, it is 180 feet—that’s 18 stories. 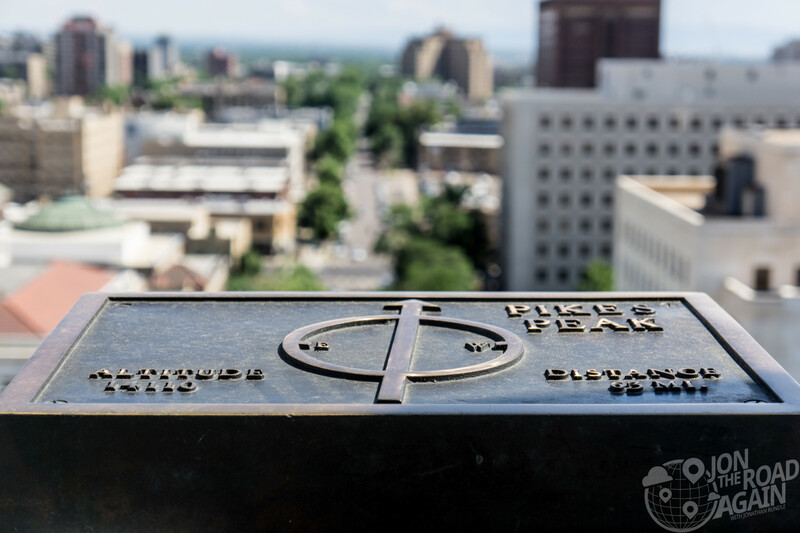 The observation deck offers great panoramic views of downtown Denver, all the way to the Rockies to the west. Plaques throughout the Colorado State Capitol’s deck point to notable mountain peaks, like this one pointing to Pikes Peak. 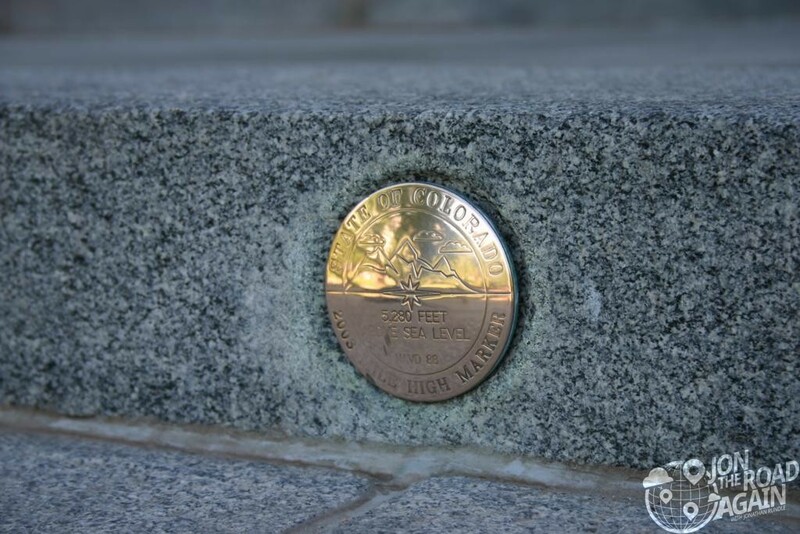 The official elevation of Denver is measured outside the west entrance to the building, where the fifteenth step is engraved with the words “One Mile Above Sea Level.” A second mile high marker was set in the 18th step in 1969 when Colorado State University students resurveyed the elevation. In 2003, a more accurate measurement was made with modern means, and the 13th step was identified as being one mile (1.6 km) high, where a 3rd marker was installed. 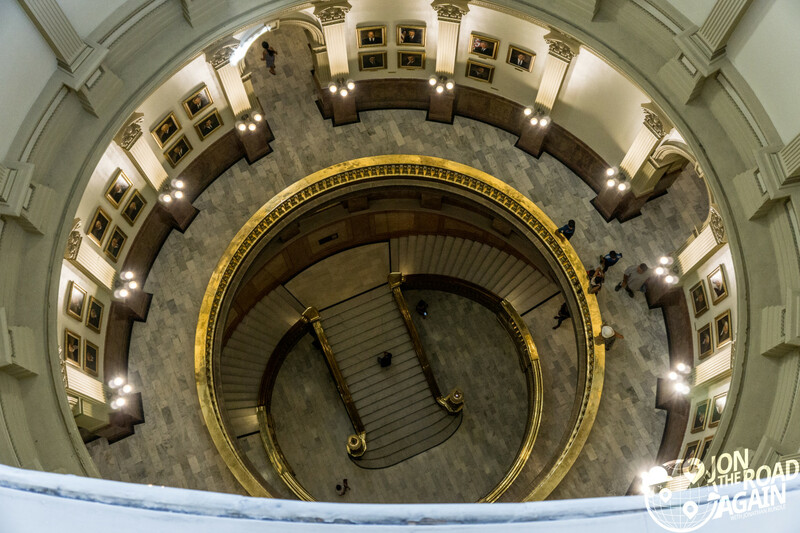 A guided capitol tour is required if you’re interested in going into the dome and out on the observation deck. Tours are free and are available on the hour from 10am-3pm. Every half hour in June and July.